The behemoth Douglas-fir rose from brittle duff on our off-trail route between Gordon Lakes. A tree that stands out in a stand of big trees is worthy of respect. Kim and I stopped to gawk. She leaned against a dark pillar four times the diameter of her own body. Furrowed bark mirrored deep basalt canyons falling steeply northward into the South Santiam River. Conk rot seeped into the base. The crown broke against the blue sky, perhaps snapped off in the Columbus Day storm of 1962. Many of the limbs, some the size of small trees, were dying. The old tree was on its way out. If it was lucky enough to escape future fires or big winds, it might live for only one or two more human lifetimes. Kim was the first to notice the most striking feature of this colossal Douglas-fir. In a circle beginning about 10 meters away from the trunk, the ground sloped upward toward the tree, as though a silent slow-motion eruption was rising from deep beneath the duff. At the base of the trunk, the forest floor was raised by about a meter. The bulging soil was an outcome of an invisible but massive root system anchoring the great tree on the basin floor. When we think of roots, we are conscious mostly of how they support a tree like this one that imposed itself so magnificently above us. Other giants in the Gordon Lakes grove had toppled, reminding us that a healthy root system is a necessary but uncertain anchor providing resilience in the face of mountain winds. In grade school we learned that roots absorb water and nutrients from the surrounding soil. Tree sophisticates know that water molecules stick to one another in the interconnected woody cells called xylem, forming an unbroken column from roots to needles. This column is pulled upward from the roots as water molecules exit the open needle pores high in the canopy. Our basic view of roots as critical to the functioning of a tree is correct. But those unseen roots pushing up the old growth duff were an invitation to a more expansive view of the centuries-long impact of this ancient Douglas-fir. Its life may have begun when a large huckleberry-season fire scorched the basin centuries ago, a time when the Santiam Molalla still traveled the well-worn east-west route along the South Santiam River. After the fire, a surviving Douglas-fir sent a small helicopter seed whirling to the scorched ground. The rains came. The seed germinated. Ravens and flying squirrels and huckleberry-seeking Molalla could not see the network of tendrils spreading outward into soil made rich by nutrients from the burned forest. Mycorrhiza of an Amanita mushroom. These new roots were colonized by a community of symbiotic fungi, the mycorrhizae, that wrapped themselves around root tips with tiny club-like fingers. Mycorrhizal filaments slip between cell walls, minute projections that enhanced water and nutrient uptake in exchange for carbon fixed by photosynthesis in sunlit needles. This mycorrhizal community expanded as the tree aged. Mushroom aficionados recognize many of these fungi for the fruiting bodies that erupt after fall rains. The names are as mysterious and beautiful as the mushrooms: Russula, Lactarius, Boletus, Cantharellus, and Hydnum. The old Douglas-fir does not care how we name them. But I do. In my brain, the moniker Golden Chanterelle exists symbiotically with autumn rain, contorted orange funnels nested in emerald moss, pungent mushroom steam rising from a hot skillet into my nose. This old tree does not care that humans have entered an era of “root consciousness.” Because we have no roots ourselves, we’re a little slow on the uptake. We now know that hair-like strands of mycorrhizal fungi, the mycelia, reach from root tips to connect with the root networks of other trees. The connection between these strands is not passive. Fungal filaments are the nerve net of the forest, the intermediaries through which trees communicate. Trees exchange specific nutrients with one another, sometimes preferentially to seedlings and nutritionally deprived individuals in the network. Damaged or infected trees send warning signals to neighboring trees as chemical or electrical impulses. 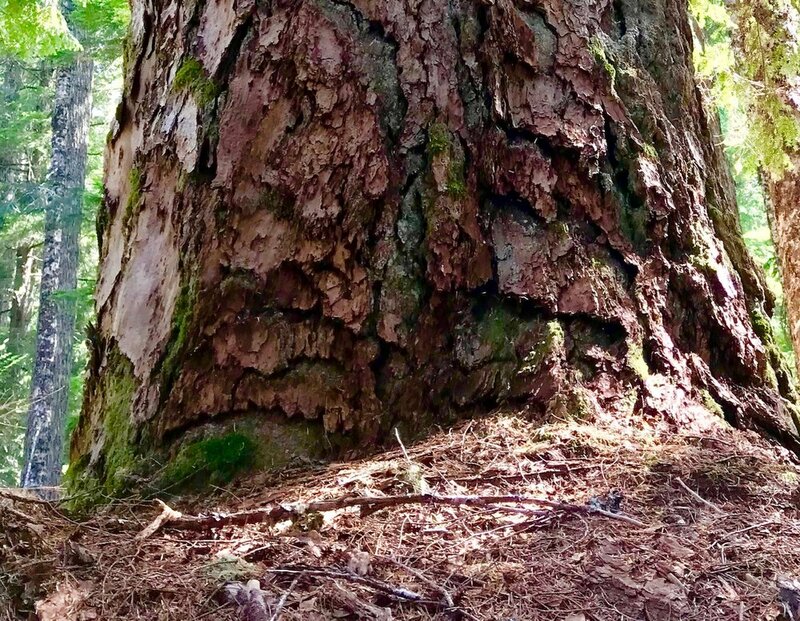 This particular Douglas-fir is likely a “hub tree,” one that is more highly connected than others through the mycelial network, a tree whose death would have a large impact on the interconnected community. For a moment I imagine what might be communicated through mycelia with the first shuddering bite of a chainsaw. This is a sobering perspective on the sterile term “wood products.” Science warns us to avoid inferring “consciousness.” But how certain can we be? This old Douglas-fir probably doesn’t care what I learn from it. I’m slow on the uptake because I have no mycorrhizae with which to share the language of roots. But I need to learn. I lift my hand, rest it against the trunk. Rough bark forms small indentations in my palm. The tree remains silent. I’m left with only my own language, only the slow motion gathering of knowledge through science, cobbled with intuition, imagination, and metaphor. I have only my senses bombarded by phrases of flicker call, canopy vertigo, bobcat spots of broken sunlight, springy duff rotting above huge roots. The language of roots remains foreign and maybe complex. But the messages are simple. Stay put. Grow steadily. Become an anchor. Provide a safe harbor. Connect with others. Transform your place. Share.